Regardless of whether you label it timeless or classic, West Side Story is as meaningful today as it was in 1957 when it debuted on Broadway. Thanks to Virginia Rep’s current production of the musical, the beautiful music, lively dancing, and social themes are back in the spotlight. And what a spotlight it is. 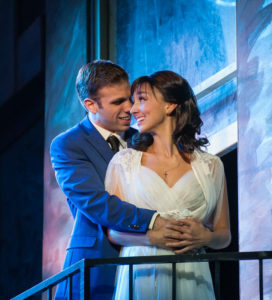 Staging and performing the Tony Award-winning musical, which spun off the Oscar-winning 1961 film starring Natalie Wood, Richard Beymer, Rita Moreno, and George Chakiris, isn’t an easy task. Stepping into the shoes of the Broadway and film stars can be quite daunting, but Virginia Rep has done it with confidence and finesse. Director Nathaniel Shaw chose to keep the same look and reproduce the original choreography of Jerome Robbins. And that works in the production’s favor. The dancing throughout and the fight scenes are well executed, in sync and riveting. The action moves steadily and deliberately. Actors are in character not only onstage but also in the wings, making the stage seem larger and more realistic. Shaw additionally uses the stage and added balcony level to move the action along and provide touching vignettes. 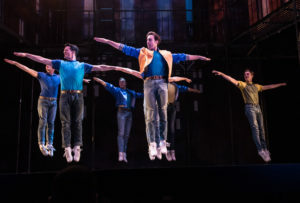 The show’s themes resonate as much today (maybe even more so) as they did in the late 1950s, and even further back to Shakespeare’s time when he penned Romeo and Juliet, which served as the inspiration for West Side Story. Watching the performance, it’s difficult not to think about the world today and the divide that seems to be growing rather than shrinking. At the heart of this play is the message of love and how it can bring people together if people choose love over fear and prejudice. Virginia Rep’s production brings that to the surface throughout the show, but especially in the powerful closing minutes. The beautiful music of Leonard Bernstein and lyrics from Stephen Sondheim take center stage in Virginia Rep’s production. The songs are meaningful, heartfelt, and enchanting – and some of the most celebrated songs ever written for a musical. Unfortunately, I had trouble hearing all the words clearly, which may be attributed to opening night sound system kinks that will be worked out. The talented ensemble 28-member cast keeps the music flowing and the action moving. And even though it’s a big cast, the stage never feels too crowded or in unordered chaos. While there are lead characters in the production, it’s the entire ensemble working together that brings life and meaning to the show. Special mention goes out to Brittany Santos (Maria) whose voice is heavenly and who brings every emotion to her performance, Maria Cristina Slye (Anita) whose dance moves are phenomenal, and Justin Luciano (Tony) whose acting skills capture Tony’s struggle with loyalty as he falls deeper and deeper in love. Kudos go to Sarah Grady for the absolutely gorgeous costumes that bring vibrant color to the stage, and to scenic designer Scott Bradley for a set that is the perfect backdrop for the action on stage. 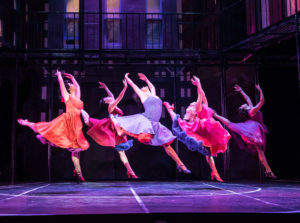 Virginia Rep’s production of West Side Story should start some compelling conversations and leave people with a message of hope that one day, everyone can find that Somewhere that Tony and Maria yearn for. Recommended for ten and up, the show is a summer must-see for families. West Side Story runs through August 5 at Virginia Rep’s November Theatre. For tickets and showtimes, go here.